Learn more about our strategic plan for the taxi system. Find out more about the exhibit publication. Launched in 2006, Taxi 07 was a multi-phase program that celebrated the taxi's centennial, facilitated innovative new taxi designs (Taxi 07 Exhibit) and, in partnership with the New York City Taxi & Limousine Commission, developed a roadmap for how to improve the taxi system over a 10- year period (Roads Forward). With Taxi 07, the Design Trust successfully activated innovation in a system long considered intractable, furthering its efforts to re-imagine the taxi vehicle for the twenty-first century which first began in 2005 with Designing the Taxi. 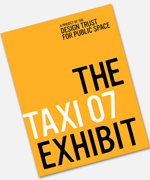 "The Design Trust's Taxi 07 project was the genesis of the Taxi of Tomorrow program." The Taxi 07 Exhibit premiered at the New York International Auto Show at the Jacob Javits Convention Center, April 6-15, 2007. With this ambitious, large-scale public exhibit, the Design Trust showed tangible improvements to the taxi vehicle and system, demonstrating that the yellow cab can and should stand for our city's commitment to sustainability, accessibility and good design. "Earlier this month, at the New York International Auto Show, an exhibit celebrated the 100th anniversary of the gasoline-powered taxi in New York City...the goal of the taxi exhibition was to reinvent the New York City taxi. Several designs incorporated hybrids, alternative fuels, and zero emissions technologies. After 100 years on the road, it is time to paint NYC's taxis green." 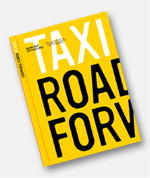 In partnership with the New York City Taxi & Limousine Commission (TLC), the Design Trust created the first strategic plan for how to improve the New York City taxi system over a 10-year period, Taxi 07: Roads Forward. This publication provides the City of New York and TLC the most thorough information available about the current state of the taxi system and outlined ways to improve this crucial transit link. The primary authors of this publication are six Design Trust fellows, an outstanding interdisciplinary team that includes urban planners, information designers, economists, and transportation experts: Rachel Abrams, Sylvia Harris, Adam Millard-Ball, Eric Rothman, Anisha Sawhney, and Rachel Weinberger. "Roads Forward is the gold standard for informing policymakers. I reference it all the time." In celebration of the cab's centennial, Taxi 07 sponsored a series of public events and educational programs that stimulated debate on how to improve the cab for its next 100 years. Many of the Taxi 07 programs took place during "NYC Taxi Week" (April 6-15, 2007), including a program about the taxi centennial on the PBS series "New York Voices" on April 13, and a month-long taxi film series at the IFC Center. On April 4th, the Empire State Building was lit in honor of the centennial and Taxi 07. The first public event was "Transforming an Icon," a panel discussion that explored how the city's top designers are approaching the challenge of improving an icon such as the NYC taxicab. "The Design Trust has convened an essential dialogue, and it will continue, with all parties recognizing that the design of the physical object is intimately connected to economics, politics, and culture. It's not just the shape of the car, in other words. But it does, in the end, all come down to design, and to figuring out a way not only to conceive of a better objects, but to making it happen." – Paul Goldberger, "A Taxi is Not a Car"